CLEGG’S IMPRESSIVE MEMOIR ON HOW THE RIGHT TO A FAIR TRIAL HAS BEEN PUT AT RISK An appreciation by Elizabeth Robson Taylor of Richmond Green Chambers and Phillip Taylor MBE, Head of Chambers and Reviews Editor, “The Barrister” It is always a great privilege to review a contemporary legal memoir, especially in the dramatic area of criminal law. “Under the Wig” from Bill Clegg is no exception. His collection of reminiscences interspersed with his personal biography should be read by all aspiring barristers seeking to practice at the Criminal Bar today. It will be of considerable interest to applied criminologists and general readers with an interest in some of the “biggest” trials of recent years. “Balance” is what you get with Clegg’s approach and his special legal professionalism as one of our foremost criminal silks. And you get the answers to the usual questions advocates are asked: “how can you speak up for someone accused of a savage murder? How do you sway a jury? 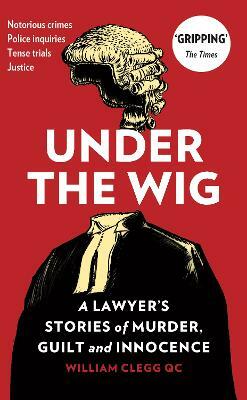 Or get a judge to drop a case?” These, and many other simple questions are brilliantly answered in “Under the Wig” revealing knowledge many did not know before. For the uninitiated, the publishers invite the reader to “meet London’s top murder case lawyer as he meets clients in prisons, confronts witnesses in packed courts — and frees innocent people jailed for decades”. Well, it is bit more than that. We liked the many tips throughout the book which any law student needing advocacy assistance will find invaluable, but we will not give you spoilers as you must read the book yourselves to see what we mean. And it is rightly described as a “vivid memoir”, because Bill revisits his most intriguing (and notorious) trials giving us new insight into what happened. The matters range from the acquittal of Colin Stagg to the murder of Jill Dando, and from Britain’s first Nazi war criminal to the man given life because of an “earprint” – yes, an earprint - which the Expert Witness Institute might find of interest as we don’t seem to have an earprint expert here. And between the factual reminiscences set out, Bill’s approach “lays bare the secrets of his profession” as well for those contemplating a legal career. We have all probably been there covering rivalry among barristers to the nervous moments before a verdict — and how our right to a fair trial is now in peril. So, as the publisher suggests, “switch off the TV dramas” and plunge yourselves “into the criminal law in action”. Clegg talks of these renowned matters with an advocate’s candour, including the murder of Rachel Nickell on Wimbledon Common; the Chillenden murders of Dr Lin Russell and Megan Russell; Private Lee Clegg (no relation as the press regularly pointed out in Belfast; Jill Dando; the first Nazi war crimes prosecution in the UK; Joanna Yeates; and the Rebekah Brooks Phone Hacking Trial. The possibility of damage to the rule of law with the right to a fair trial “put at risk” is the abiding memory we have at the end of the book- with “what I like doing more than anything else is reading a new case”, and “that moment when I am about to turn the first page still thrills”- it is the same for me and I don’t specialise in crime anymore as the adrenalin is there in civil justice, too. “Under the Wig” is one of the best memoirs of recent years. Thank you, Bill. The book was published in 3rd October 2018 and is also available as an ebook and an audiobook.